The other day we wanted a sweet little something after dinner. Nothing to complicated just a little chocolate treat to cure our sweet craving. Brownies immediately came to mind, but I didn't have a mix on hand. What I did have was a easy brownie recipe and all the ingredients to make it. So brownies it was! These weren't just any brownies, but Chocolate Blender Brownies that I made in my new Blendtec Blender. 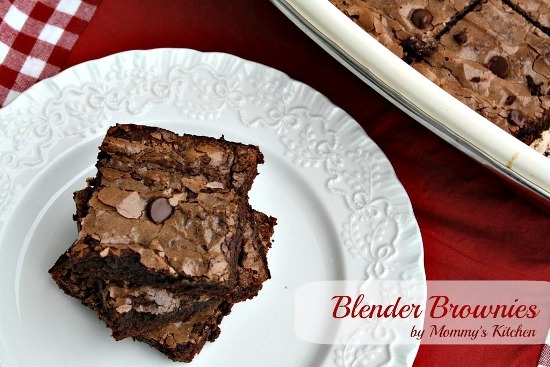 Yes you heard right brownies made in a blender. Who would have guessed you could make brownie batter in a blender. When I think of blenders frozen drinks, milkshakes and smoothies come to mind, not cake batters, cheesecakes and frosting. I have to say I have thoroughly enjoyed testing out my new blender. You see I have only owned a few blenders in my lifetime and they weren't anything special. Me and blenders, well we never seem to really get along. Either I burn up the motor or loose the pieces to it, so I never buy anything too expensive. I mean aren't all blenders pretty much the same? Well I can honestly say the answer to that question is no thanks to the nice folks at Blendtec. I'm so thankful that Blendtec gave me the opportunity to review their Blendtec Total Blender Classic Wildside. I wasn't really familiar with Blendtec blenders, so I was anxious to get started. To start I have to say that my favorite feature on this new blender is that it's an all-in-one appliance. It makes smoothies, fresh juice, ice cream, milkshakes, cappuccinos, margaritas, soups, sauces, bread dough, dressings, salsas, and more! It's hard to believe, but this blender replaces up to 9 other appliances. It's powerful, fast and easy to use. Included with my new Blender was a 200 page "Fresh Blends" Cookbook. I was quite impressed with everything you could make in this new blender, quick breads, soups, marinades, ice cream, pizza dough and dressings. Also included is this cool Twister Jar used for, nut butters, hummus, baby food, thick milk shakes and sauces. I haven't had a chance to try out the twister jar yet, but I will soon. Blendtec included a separate cook book filled with recipes exclusively used in the twister jar. I spotted a recipe for Fruit & Nut Energy Bars I can't wait to try. The brownies were easier than ever to make. Just add the ingredients, select the batter cycle and the blender does all the rest. The wildside blender has Smart-Touch Technology with a LCD information window that lights up. I was a little nervous at first when I heard the blender rev up and down, because I wasn't quite sure what was going on. No worries though! I found out it just means when a cycle button is pushed, the blender automatically speeds up and slows down, then shuts off when the cycle is complete. My favorite part was the digital countdown on each of the cycle selections. The brownie batter was smooth, creamy and perfect. Not only have we made brownies, but a few smoothies as well. 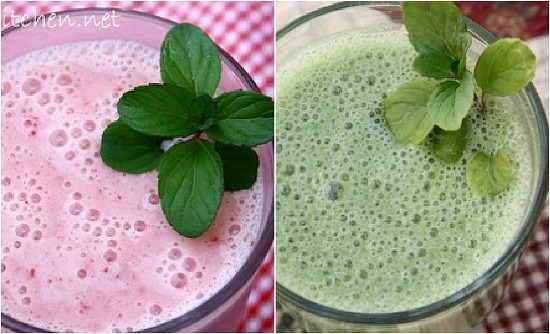 Our top two favorite smoothies are Strawberry Banana Smoothies & Green Monster Smoothies. Before this powerful blender came into my life I thought my smoothies were pretty tasty. Well, now my smoothies are over the top. I love how this blender blends everything together even fibrous veggies. Now I can leave the stems on my strawberries and the seeds in my favorite fruits for extra nutrition. I left the stems on the strawberries and you couldn't even tell in the end. With this new bad boy I will be able to get so many different fruits and veggies past my picky kids. Before I go I wanted to included a a demonstration video from Blendtec, This video will show you just how powerful this new Blentec Blender really is. If it wasn't for this video I would of never know that I could add the green tops of veggies and seeds from fruits. Plus I know I'm forgetting some other great features of this beautiful blender. Preheat oven to 350 degrees. Add butter and chocolate chips to blender jar. Secure lid and select "batters" Add eggs, cocoa, sugar and vanilla to jar and secure lid. Press pulse 3-5 time. Add flour and secure lid. Press pulse 3-5 times and use a spatula to scrape the batter down the sides of the jar. Pour into a greased 9x9 or 11x7 inch pan and sprinkle on some additional chocolate chips. Bake for 30 minutes or until a wooden toothpick comes out clean. I’m beyond excited that Blendtec has graciously offered to give one Mommy's Kitchen reader a Blendtec Blender and Twister Jar valued at $454.95!! 1. Leave a comment letting me know what you would use your Blendtec Blender for? 2. Become a Fan of Blendtec on Facebook. 3. Follow Blendtec on Twitter. This giveaway begins today 9/27/12 to 10/5/12. Comments will close at 11:59 CST. Winner will be chosen via random.org. Winner will be notified through email. Please make sure you leave a valid email address so I can contact you in the event that you are the winner. 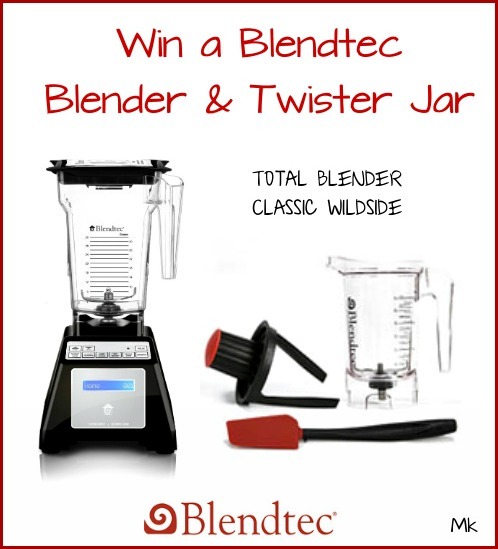 Winner will receive (1) factory refurbished Blendtec Total Blender Wildside in your choice of black, white or red. Winner will have 48 hours to reply to the winning email or a new winner will be chosen. Product will be shipped by Blendtec. Disclosure: I was provided with a Refurbished Blendtec Blender to test and review. 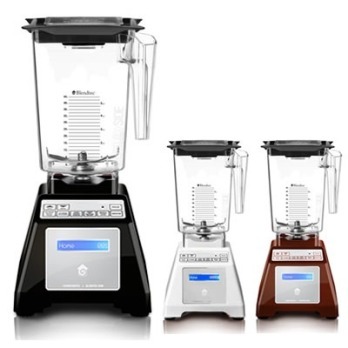 Blentec also provided a second blender to use in a reader giveaway. The opinions stated above are entirely my own. No other compensation was received. I would use it for—everything! Oh my friend has one of these and made me some ice cream....so good! I would make baby food and smoothies and so much more! this sounds like an awesome machine! I would use it to make smoothies --- and blender soups. It looks like an awesome machine! I like Blendtec on facebook now! I already follow you on Facebook! Love it! I follow Mommy's Kitchen on Facebook --- which is how I knew about this giveaway. Please enter me in your drawing for the Blentec! Thanks! Would love to have one for all my cooking and baking needs. Looks beautiful, psst - I hear it calling my name! I would use it for smoothees and to make cakes and things. I'm also interested in trying my hand at hummus and soon will be making baby food again! I would use the blender to make my impossible pies...and the twister for our lime sherbet freeze.. I'd use it for making smoothies and iced frappuccinos! I'm sure I'd have such fun just trying about anything. Have only had the cheap models myself:)I do follow you on facebook already and will now like blentec! I liked mommy's kitchen on facebook. We make Green Monster smoothies everyday and I would LOVE to make them in this bad boy! Unfortunately, I don't have a Twitter account. I like Mommy's Kitchen under the name Bob Smith. I am now following Blendtec on Facebook! I liked Blendtec on FB under the name Bob Smith. I would love to try making batters and dough with a blender. It sounds so cool! My email address is tari.millis@gmail.com. Thanks! At this very moment I would definitely use this blender for making pesto out of the tons of basil still growing in my garden. It would be amazing! Thanks for the chance to win! And I'm already following Blendtec on Twitter! Awesome giveaway! I would use my blendtec for fruit and veggie juices. I am following Mommy's Kitchen on Facebook! It sounds like I would use the Blendtec for everything! I shake sounds yummy!! I would use it for yummy milkshakes! I love to make my own almond milk and I'm sure a Blendtec blender will do it better. I would use this for absolutely everything! I have wanted one of these for a long time. LOL! Seems like I can use it for more than I thought! Bring on the new recipes! I have "liked" on FB. "Liked" Mommy's Kitchen on FB as well...fingers crossed! I "liked" Blendtec on Facebook. The first thing I would make is coconut milk. I attempted it with my horrible blender and it was no good. More like water with coconut bits! Sounds like this blender could handle the job! I would use this for ice cream!!!! Blendtec has been on my wishlist for quite some time! I would use it for everything lol. I tried to display it on my blog, but I can't seem to get it to show up on my profile. I'll keep trying. My daughter was born 16 weeks premature and during an intubation her vocal cords were scratched so she had to get a trach. She also had to get a gtube. I would use the Blendtec to puree her meals as she gets older to put in her gtube. And I might make myself some ice cream in it since taking care of her is a big job! I "liked" Mommy's Kitchen on Facebook! I am looking forward to seeing what great things I could make with it. I think these brownies might be the first thing. I liked Blendtec on FB. I would use it to make margaritas. I liked Mommy's Kitchen on FB. I would try out a bunch of new recipes for sure! Thanks for letting me join in the givwaway! I'd love a blender to make everything. Probably smoothies; neither of my boys are big milk drinkers. At least with smoothies I know some calcium is getting into their systems. Everything... I'd really love to make smoothies with this blender though. OOOh! I love that blender. I am a big fan of smoothies and making salad dressings in a blender. Well of course I'd use it to keep trying your recipes! I love your site and save and pin so many of your recipes! My passion is cooking for anyone and everyone. It would get an awful lot of use in my kitchen!! I would love to get into green smoothies! I already like Blendtec on Facebook. I already follow Blendtec on Twitter. I would use it to make soup, salsa, and smoothies! I would make soups and smoothies and milkshakes and perhaps breadcrumbs. I would make smoothies and the blender brownies! i would use for everything. i want one!! I would use a blender for lot's of neat things. Crepes, smoothies, and would love to try brownies! I'd use it for smoothies. I always do this wrong, but here goes nothing. I would love a Blendtec to make smoothies with!! I love green monster ones the best and my daughter loves yogurt with any kind of berry! I liked Blendtec on facebook and left them a comment too! I followed Blendtec on twitter and tweeted them!! I liked mommy's kitchen on facebook!! OMG! I put my URL but not an email!!! It's lisa.prit@yahoo!! I would use it to blend iced coffee's. I can never get the ice to be totally slushy - its always a bit crunchy :(. I would use it to make Magic Milkshakes (they taste like a Wendy's Frosty) - my husband's favorite! I would use it for veggie smoothies & ice cream & soup & gluten free bread dough & all sorts of fun things! I would make smoothies, although the brownie recipe looks good too! 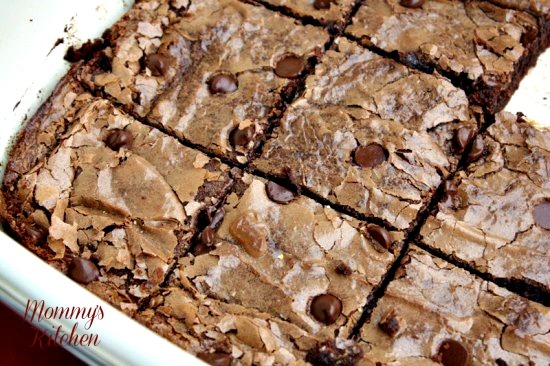 Some of them brownies ...and a whole lot more! Oh my, oh my.... How do I love thee Blendtec Blender! I have never owned a Blender, and I would just be so thrilled to own this beauty. I would love to make so many things! Hummus! Soup! you name it! I could use all my delicious recipes from Pioneer Woman who I adore. Oh please oh please pick me lovely Rafflecopter! I would use it for smoothies and would love finding out all the wonderful things I could make with it! I would use this for everything! I like you go thru blenders this would be great for our smoothies but I also make a pumpkin pie in our blender so would love to see what this machine can do. Also I can not figure out the identity thing so I am including my email here. 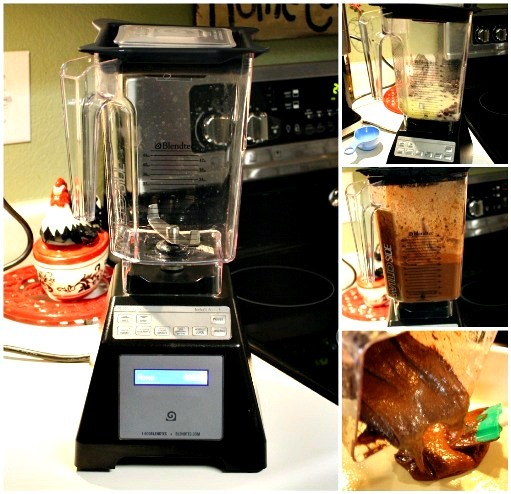 legolas99@charter.net Heather T.
Oh,I dream of owning a Blendtec Blender! I would use it for so many things--smoothies, Hollandaise and other sauces, salad dressings, marinades, milk shakes, ice cream, and the list goes on. Thank you for the chance! I follow Blendtec on facebook. I think I need to make your brownies!! I would love to use it for all kinds of cooking, but would probably use it most for smoothies! I would start with smoothies and go from there! I would use it for protein smoothies and banana "ice cream"! smoothies, soups, ice cream- everything! I would make Cashew Butter! Your brownie seems SO good !! I would use mine to make fruit smoothies and milk shakes. I would use my blendtec blender for smoothies and brownies. I would use it for milkshakes and smoothies and everything else! I liked Blendtec's facebook page. I love making my own bread and would love to try the Blendtec,It would make my life so much easier. I would use it for smoothies..my daughter's favorite blender treat. I would use it to make milkshakes and puree different things like tomatoes for vegetable soup. Would love a new blender. I have my mother's (she's 89) so you know how old it is (over 30yrs old). I love to make hummus and of course make milkshakes since that' the only way I drink milk these days. Sue sueannames@gmail.com. I would use my new blender to make smoothiess and Margaritas! I already like you on FB and have shared your website and recipes with friends and family. I would use the blender for salsa, hummus, soups, smoothies, sorbets, baking, tomato sauce...I love to cook and bake and would give it a good workout!